A 71 yo male with CRI and a creatinine of 4 presented with dehydration and a wide A-a gradient. CXR was normal. His creatinine bumped on admission; as such, we did not want to do a CT scan. So, we obtained a V/Q scan. Quick question: if a patient has an indeterminent V/Q scan because of a mismatched defect in the RML medial segment, can a PE be effectively ruled out with an isolated injection of the corresponding vessel supplying the RML? This man has biopsy proven sarcoid. His xray is shown here; it has not changed in 6 years. What has changed is his FEV1 which was 59% predicted in 2001 and is now 30% predicted. 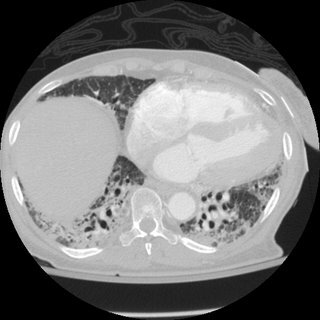 He has no shortness of breath or dyspnea on exertion AT ALL. He has a moderate cough. He is leary of steroids but will do what's best. Would you "insist" on treatment? 34 Y/O F who presented to the ER with a week long history of progressive dyspnea. She complained of DOE with moderate activities and intermittent SOB at rest. No other associated Sx. She is otherwise healthy. Her vitals were normal, sat 97% on RA. Physical exam, ECG and CXR were normal. She has no risk factors for PE, and her Wells score was 0. A V/Q scan was done in the ER with preliminary report of intermediate probability. She was started on heparin, admitted, and LE dopplers and CT-angiogram were ordered. D-dimer was not obtained. The following day the final report on the V/Q scan was changed to low probability, LE dopplers were (-), and the CT-angiogram showed a filling defect in a LUL sub-segmental artery suspicious for PE. Her inpatient team started her on Advair and discussed the options of angiogram and anticoagulation with her. The feeling was that she is low risk for a PE and that the CT-angio is likely a false (+) and she decided not to have an angiogram or start coumadin, and she was discharged home. She now presents to clinic with continued symptoms of dyspnea, no new symptoms, and a normal exam. Spiro shows a very mild obstructive defect with normal FEV1. How long after a PE would you expect to find an abnormality on angiogram? When is it safe to commercial air travel after traumatic hemopneumothorax? This has come up in discussions with one of our neurologists who also sees sleep patients. Many patients with OSA are hypoxic at night and that is clearly due to the apnea/obstruction and not due to gas exchange abnormalities or structural lung Dz. Some of these patients come to us already on nighttime O2 but not CPAP/BiPAP. A small group of these patients cannot stand or won't give CPAP/BiPAP a chance and some don't want to try ENT surgical options either. However, they are willing to sleep with a nasal cannula... Would you continue with O2 (assuming you HAVE already tried to talk them into nasal pillows, nasal CPAP, etc.) in this case? Is it of benefit at all? This is a 41 y/o man with a dramatic HIV Hx: he was diagnosed in '94 when he presented with PCP and a CD4 of 7 (!). He survived long enough to be started on HAART with a great clinical response. His most recent CD4 was ~260 though he still has a detectable viral load. His HIV infection was due to remote IVDA. His course has also been complicated by CAD, previous AMI and CHF. He presented this time with acute-on-chronic R heart failure with increasing edema. 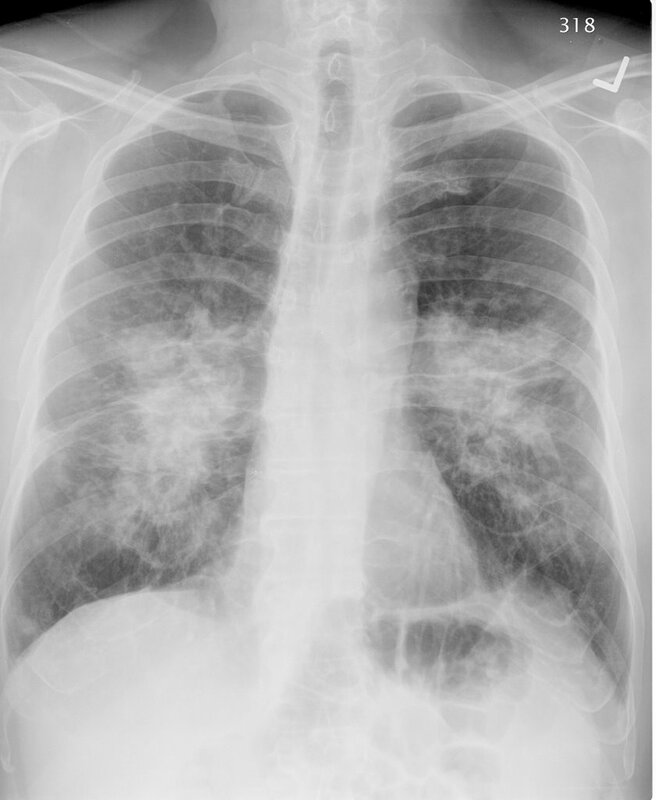 He responded well to therapy but prior to D/C he developed a cough productive of bloody sputum and had the above CxR. He is on his HAART (nevirapine, tenofovir and the lopinavir-ritonavir combo) and SMZ-TMP prophilaxis. He has a Hx of 2 negative PPDs. Would you isolate him? How would you treat him? Have you had any good (or bad) anecdotal experience with the Vest for respiratory secretion clearing? There are some published trials and I have a few people with bronchiectasis, including the Pt with Kartagener's using it. 67-year-old woman with progressive shortness of breath since September. No cough, fevers chills night sweats. Past medical history is significant for coronary artery disease, status post MI 11/2005, hypertension, diabetes, breast cancer 7/2004(5-FU,cytox, Mtx) s/p xrt, and chronic renal insufficiency. SH; ex smoker. Occupation: Did military work. meds: CAD meds and some inhalers etc. Over the last few months her dyspnea worseneed and she is now on 6 L of oxygen 24/7. What do ye all think is going on? 51 yo male with sarcoidosis manifest by low DLCO (some dyspnea with extreme amounts of exertion) and constitutional symptoms (early satiety, abdominal pain and low energy level). 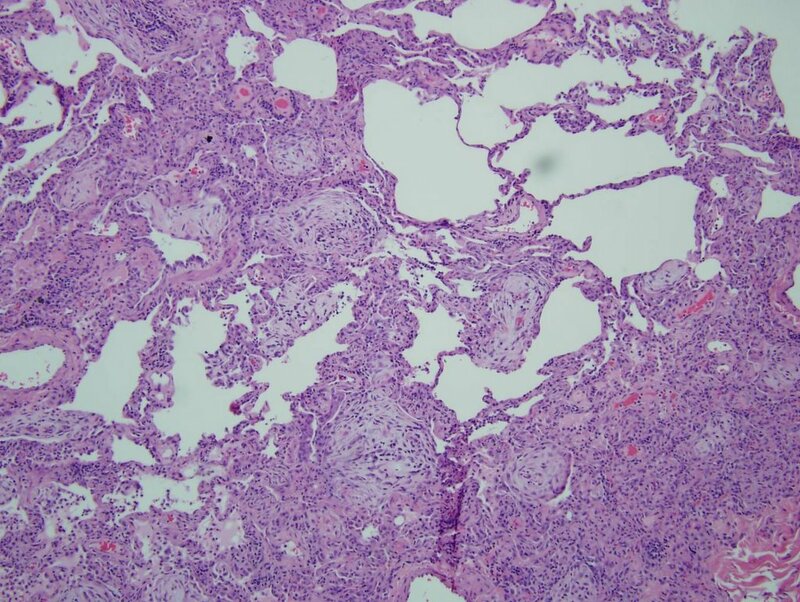 Stage II Sarcoid diagnosed with non-caseating granuloma on transbronchial biopsy. He was started on steroids and plaquenil (the latter by his PCP/rheumatologist) with good resolution of his constitutional symptoms. He was weaned off the steroids over a 6 month stretch. The wean finished about 2 weeks ago. Was seen about 1 week ago after completely weaned off prednisone. Has been having some increased dyspnea over the last 1-2 weeks that is somewhat related to exertion, but not completely. PFT's: Normal spiro and lung volumes. DLCO ~61% predicted. DLCO in November was ~72% predicted. 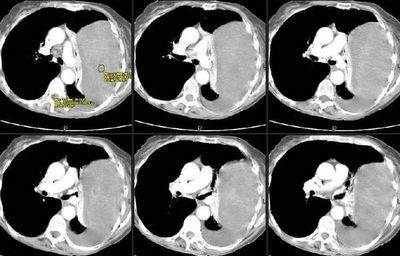 Repeat CT chest (this time with HRCT protocol). The majority of the lung is actually normal. There are a few cuts with the above parenchymal abnormalities. Steve G. asks about lung volume reduction requirements. 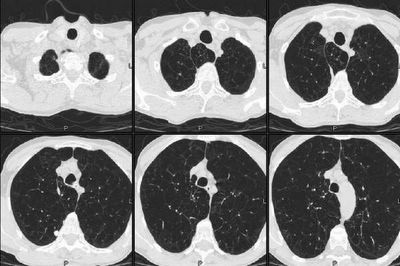 In a patient with heterogeneous emphysema in the upper lobes, what defines poor exercise tolerance? Is an exercise study necessary or can we use the 6 minute walk to evaluate? If so, how many meters would be considered poor? This is the young woman with the 30% PTx that was hard to see on the screen. I have played a bit with the contrast... 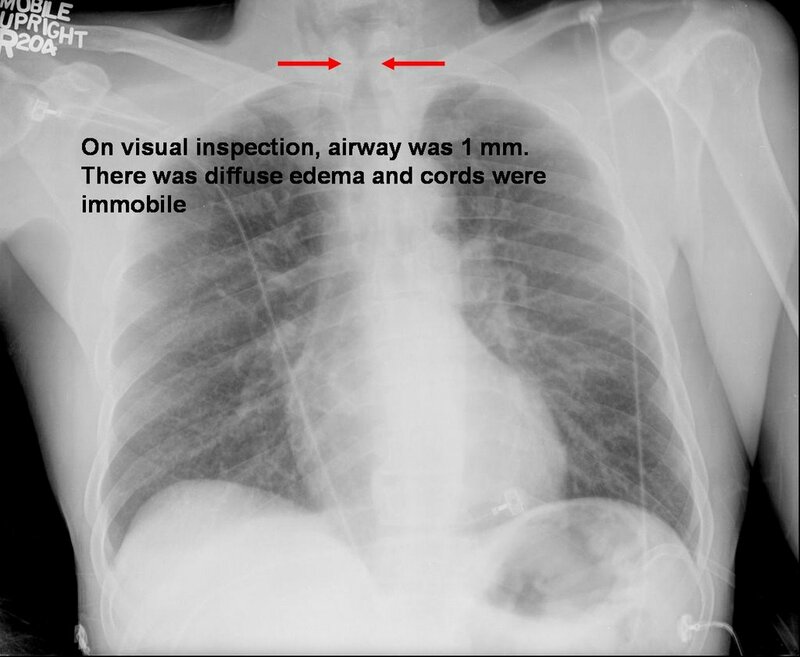 The left film is a repeat from admission with the little red arrows pointing to the lung edge. The one on the right is post placement of a Thoravent (small entry hole, small scar on this young patient) with complete re-expansion. Curiously she had a persistent small leak for a few days but eventually sealed it. Do you always do a HRCT on this patients? How would you follow her from here? This is the recent post on the 79 y/o woman with a left chest mass. You can review the CT scan here. She underwent a needle Bx which was quite bland with spindle cells. 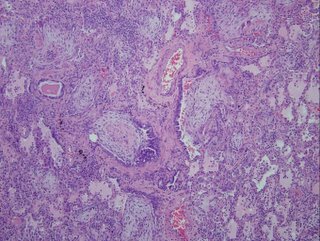 After many special stains and Path consultation with Tom Colby, the final favored diagnosis is of a low-grade fibromyxoid sarcoma. Any suggestions or expereince with this? I am not sure if the CxR will show up well. This is a healthy, active, non-smoker 18-y/o woman seen by her pediatrician for mild dyspnea and R chest discomfort. She had the CxR on the left with a spontaneous PTx and he decided to wait and follow it up. 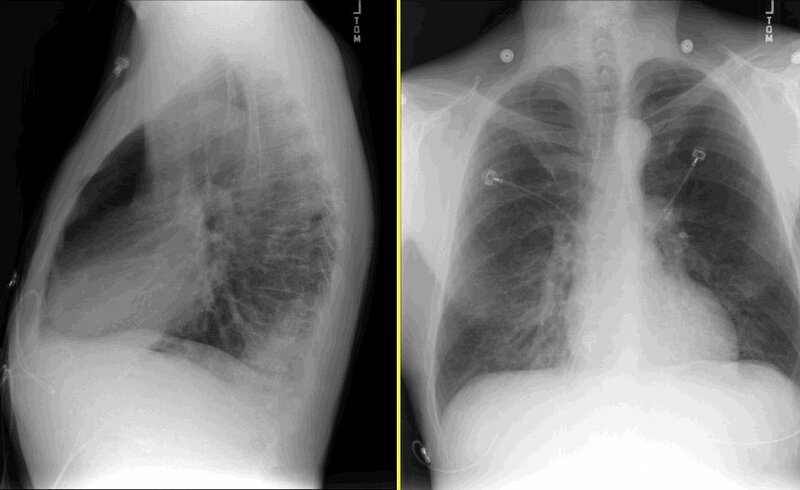 She had a repeat CxR 4 days later (not shown) with an unchanged PTx. 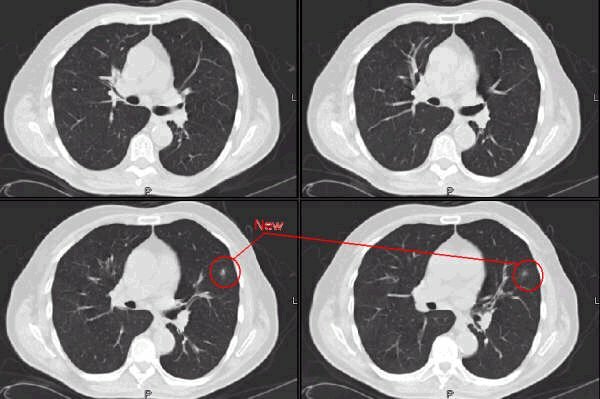 We were called 4 days later by radiology about the persistent PTx on the film on the right. She is very stable. Her Hx is otherwise really unremarkable except for her cousin having had a recurrent PTx requiring a VATS. Would you have waited those eight days just "watching" it? How do you preferentially handle these pneumothoraces (i.e. Cook cath, Thoravent, chest tubes)? He then developed SIRS (WBC, fever, tachy) but no infectious source ID'd. He was intubated. 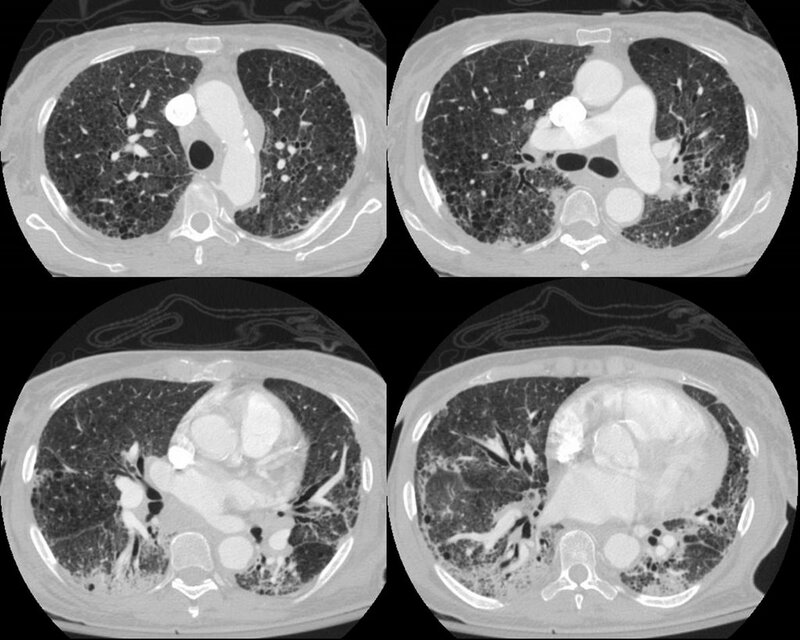 A CT is here: . What is your differential diagnosis? What tests/procedures/other data would you like to know? This man has significant alcohol abuse and came in with severe shortness of breath. 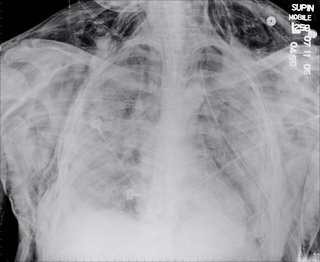 He was intubated after this chest xray. What do you see and what next? I had posted this case on two previous posts. 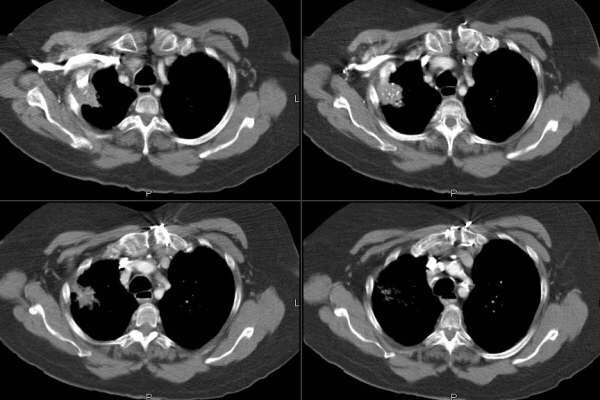 This is a 55 y/o remote smoker with a persistent cough who had an abnormal endoBBx (squamous cell Ca) despite a normal CT scan of the chest and a negative PET scan. many good suggestions were made to the role of inflammation in false-positive biopsies. I sent her to the chair of CT surgery at a nearby large university hospital and he was equally puzzled. While we were debating what to do, she developed new CHF, had a cath, PTCA, PM placed and and AICD. She has ischemic cardiomyopathy and was quite unstable to consider surgery rightb then and there. She has been stabilized, she is on medical therapy for GERD, COPD, post-nasal drip, HTN, CAD and CHF... Her CxR remains unremarkable. 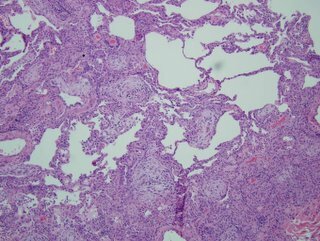 I have re-bronch'ed her for surveillance: her bronchus intermediate still has an abnormal-looking mucosa with no clear mass and endoBBx came back once again as locally invasive squamous cell Ca. Would you now suggest a lobectomy? 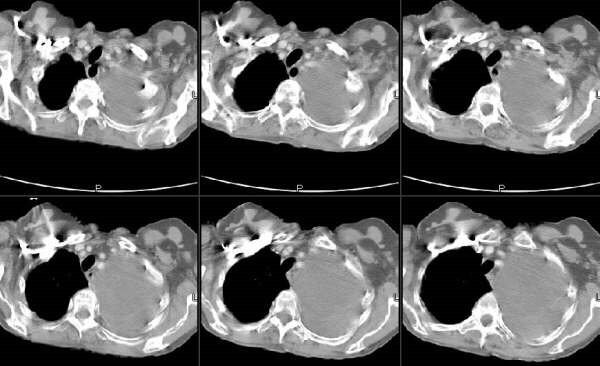 This is the recent post on the 75 y/o woman with a lung mass and a very suspicious adrenal mass (did not look much like an adenoma on CT). We had a similar thought process to the comments posted. We first tried a CT-guided Bx of the adrenal but it was not accessible. I did a bronch to get tissue (if it was a small-cell for instance than the adrenal would not change care that much). 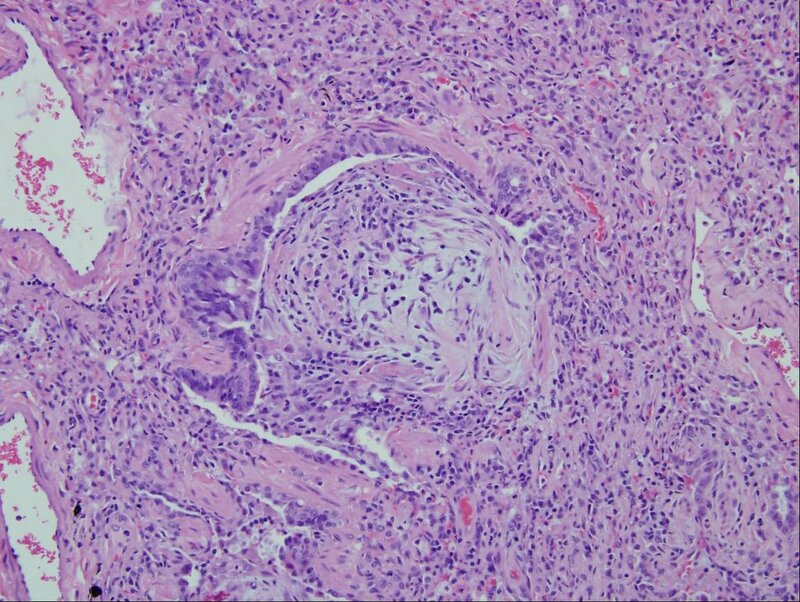 It confirmed a NSCLCa with features favoring an adenocarcinoma. 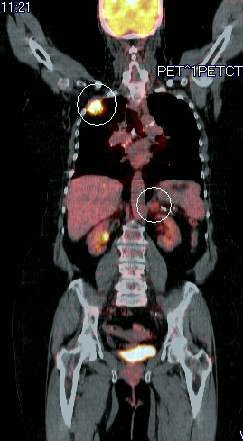 We did a PET scan as well (see below) and both the upper lobe lesion and the adrenal were "hot" the mean SUV for the adrenal was ~4.4. So now we are back to the initial question: confirmed NSCLCa, moderate COPD with a hot-but-not-biopsied adrenal. I had previously posted on my Pt with Kartagener's. She has some bronchiectasis and has been having frequent tracheobronchitis despite Tx so I bronch'ed her today for deeper sampling. I did B/L BALs. Now, on the labels would you call them Left middle lobe and Right lingula? This is a 75 y/o woman sent to us for an abnormal CxR. 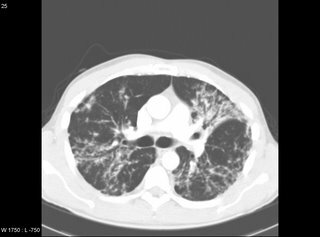 She has a 60 pack-year Hx of smoking and COPD and a remote Hx of histoplasmosis (she had a respiratory infection consistent with acute histo ~40 years ago). She has a moderately severe obstructive defect with physiologic evidence of emphysema. She has the following finding on her CT with an additional left adrenal mass. What would you do next? Would you approach the chest mass or the adrenal first? 1. The patient is not hypoxic. A 6 minute walk on RA also did not show hypoxia. A blood gas shows: PaO2 mmHg 94.5, PaCO2 mmHg 35.0. 2. The patient's red blood cell mass was normal. 3.His erythropoietin level was 19, which was normal (the hct was 43.5 that day). 4. His Hct was once 55, but usually lower. He gets frequent phlebotomies when it goes to about 50, but they have neveer seen if it would go any higher. Nice view of an azygous "lobe" with severe bullous emphysema. This is the recent post on the 79 y/o woman with a left chest mass. Jeff & Jeff made a good point about the smooth aspect and how the mass looks pleural based. Here are some of the CT images. What do you think? 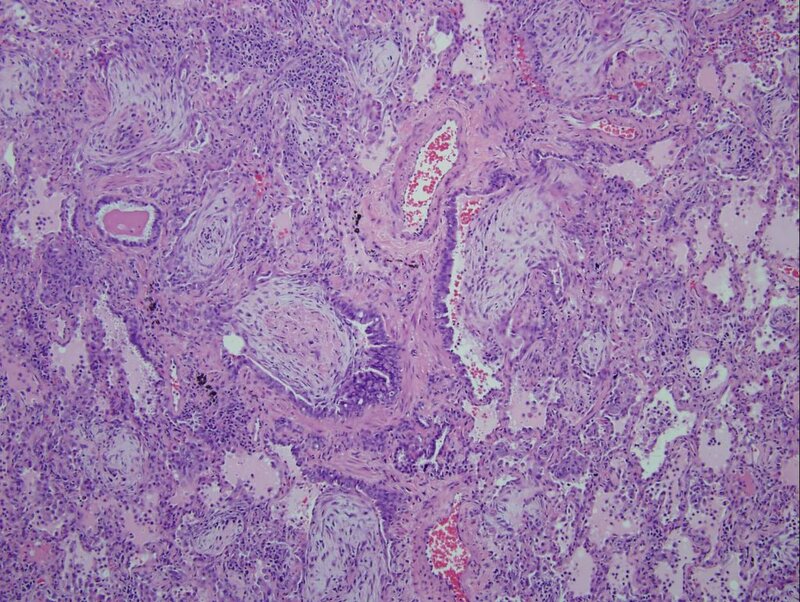 If a patient has hilar adenopathy and a biopsy shows noncaseating granulomas, we are taught that we must definitively rule out fungal (i.e. 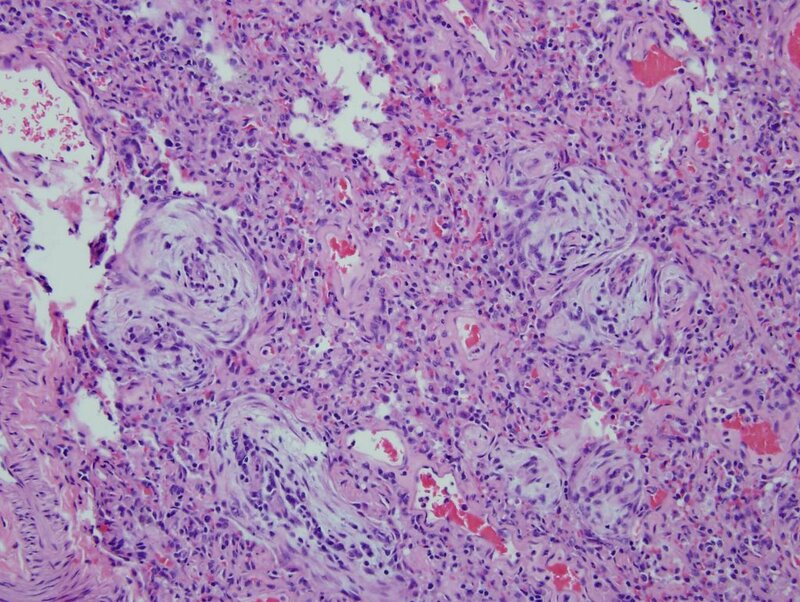 histoplasmosis) disease before settling on the diagnosis of sarcoid. What tests do you perform that will satisfy you prior to giving steroids (if the patient needs it clinically)? A serum test for IgM would only address active exposure. A urine test for antigen is low yield. 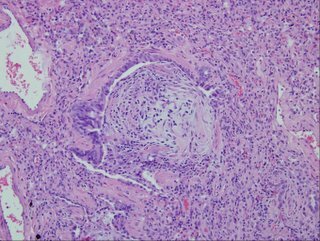 Are you satisfied with the sarcoid diagnosis if special stains are negative? This is the 79 y/o mother of one of our physicians. She has a remote TOB Hx (quit >15 yrs ago) and subacute dyspnea and fatigue (a couple of months'). 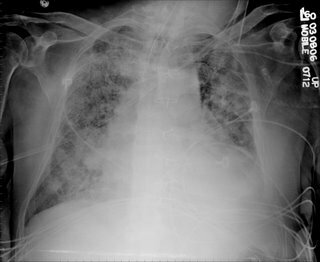 She presented through the ED with dyspnea and L atypical chest pain. Her nasal swab was positive for influenza and she had the CxRay seen above. What is your DDx and what would you do next? 30 year old with progressing infiltrates. Back in June I posted the case of a 30 year old man no PmHx with 3 months of fevers and malaise. HIV negative. CBC with normal diff without eos. 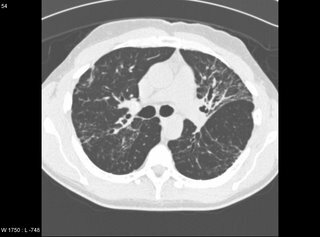 A CT on outpatient is shown here. .
His dyspnea worsened and he was admitted and then intubated. His condition worsened. For instance, here is a chest xray from one of the ICU days (the sub-cu air is from chest tubes after the VATS. He did not respoond to steroids and the micro workup was unremarkable. He died after 2 months on the vent. 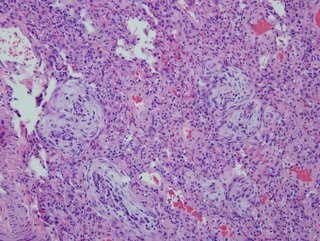 I realize there may be no pathologists out there reading this, but what would be your top diagnosis (and I'll post answer later in the day). I had been following a 79 y/o man with small non-calcified nodules with serial CT scans. 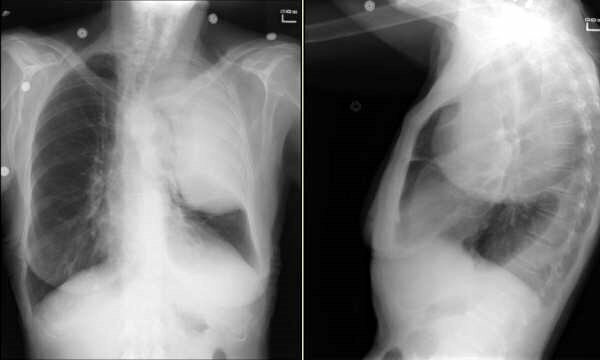 He is a lifelong non-smoker and one of his noudles was actually calcified and he had a calcified small hilar node. 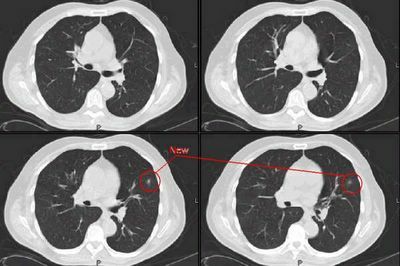 His nodules had been stable for about a year and with the lack of smoking Hx and other finding I was quite confident these findings were benign. 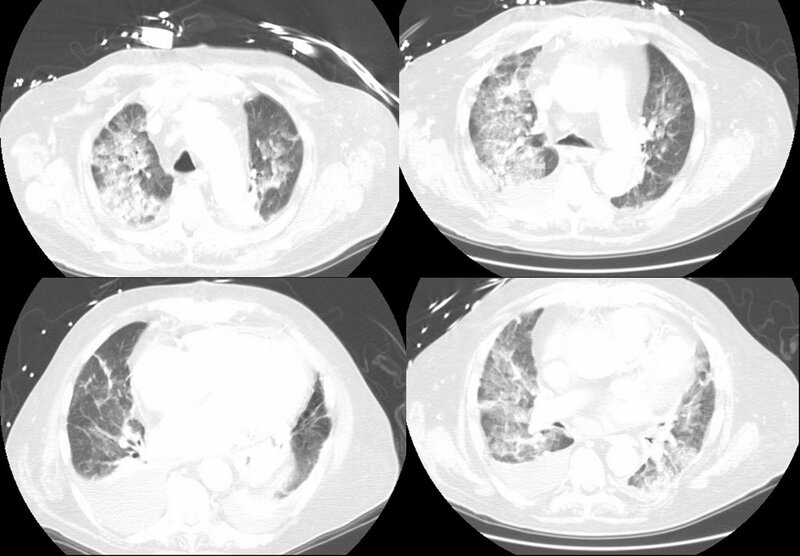 He developed a new URI and through his PCP, had a new CXR followed by a CT scan (see below). 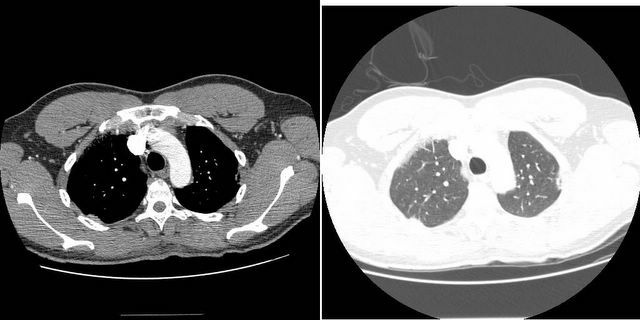 The CT revealed a small new left nodule. All the other previous findings had remained unchanged. He then had a PET-CT: the nodule, and actually all the nodules as well, was PET-negative. 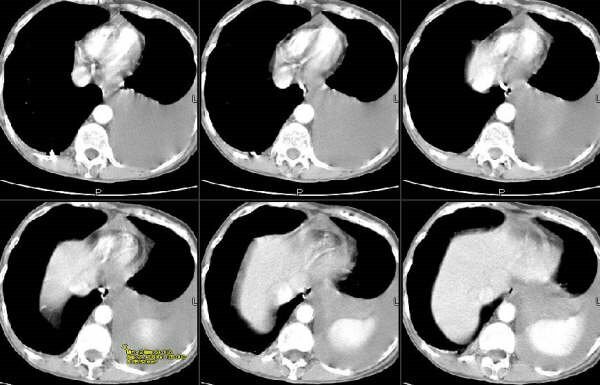 However, the left hilum (not much there on CT was positive with an SUV of 2.54 and there was a positive subcarinal node with an average SUV of 2.2. Are you very impressed by those numbers or would you write it off as inflammation and do a CT follow-up? The cardiology literature has quite a few articles showing that medical care of CHF, CAD and ACS (not counting caths obviously) by a cardiologist improves survival and outcomes compared to care by PCPs alone. There is also some data supporting ICU care by dedicated intensivists. Do you have any handy/good references on outcomes and care of COPD, asthma, lung Ca, etc. whether seen by pulmonary or not? As there have been several new cases since Jenning's recap, I wanted to make sure that the insightful comments by jgiustino did not get lost in the fray. Link through the heading of this post to see the discussion and comment further. 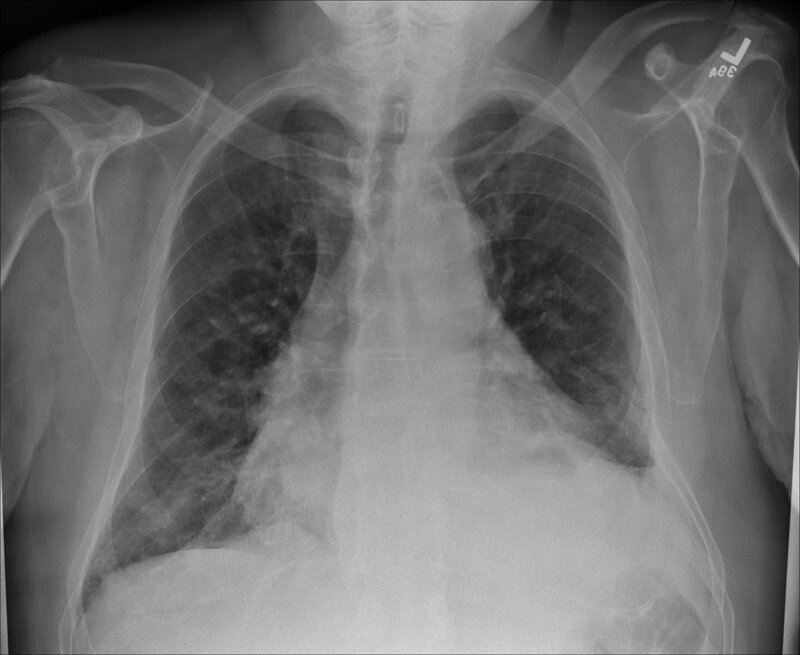 I saw a 62 year old woman (blind but otherwise healthy) for an abnormal CXR, showing a minimal infiltrate in the RUL. non smoker. no cough or sputum production. no constitutional symptoms. CT showed a tree in bud appearance in the RUL posterior segment. no bronchiectasis. PPD skin test is pending. how would you approach this in this asymptomatic patient? go straight to BAL? try to induce sputum? wait and see?